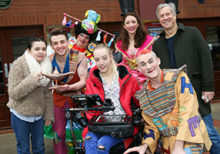 Panto stars at the Everyman Theatre in Cheltenham have teamed up with students at National Star, Ullenwood, to launch a special project marking the 50th anniversary of the moon landings – and looking at the strange species on planet Earth; Humankind. Each year the Everyman raises funds for a Gloucestershire charity working with young people and have chosen to support the National Star project, ‘Out of This World’ this year. The Everyman’s Chief Executive, Mark Goucher said: ‘We have worked extensively with National Star over the years and are proud to support this exciting project. The second phase of the project would involve auditioning people with a disability to tour primary schools with the film and lead interactive workshops using practical activities, where they unpick the themes raised in the film and help the pupils to apply the learning to their own lives and experiences. Paul Tarling, StarArts Coordinator at National Star said: ‘The National Star/Everyman partnership project, ‘Out of this World’ will develop links with local schools and educate young people about disability whilst enabling National Star students to express themselves creatively, participating fully in the local community.